At the end of the International League season we had a lot of fun charting the competition between Rochester, Norfolk, and Pawtucket. 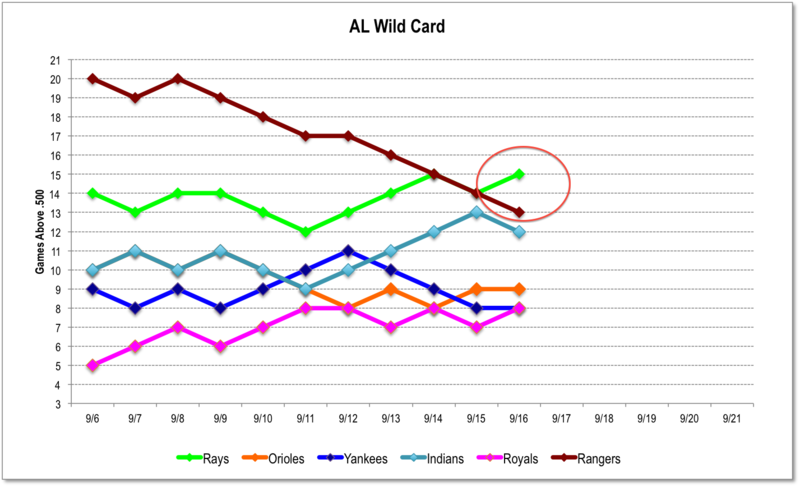 In the American League the competition makes for an even more interesting chart as there are two wild card slots. We like the way that simply tracking games above the .500 mark shows changes over time. 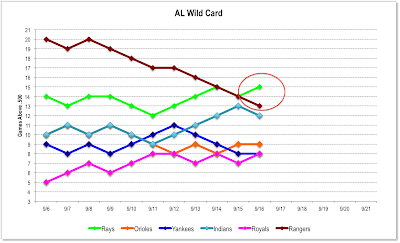 Only a few days ago we were tracking the Oakland Athletics as the leading AL wild card contender, and then the Rangers fell off the edge of the cliff and they continue to drift further and further down, perhaps to fall below the Indians in a game or so. This kind of chart does not, obviously, get into the details of matchups the way that Rays Index did the other day. But if you are a Rangers fan, you’ve got to be worried. If you’re an Orioles fan — yes there’s at least one out there — you’re only two games back. Cleveland? Could be. Could be. OT: Absolutely delighted to watch the perfect game, no-hitter, and shutout destroyed; you don't do that to us. Watched/listened to the NBCSN morons, never thought I'd say this: I miss Patrick Kinas.